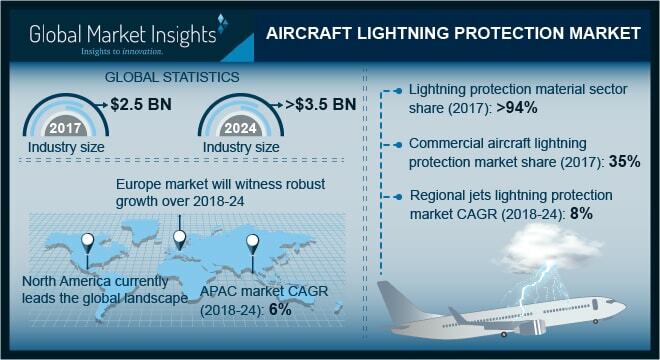 Aircraft Lightning Protection Market size is estimated to surpass USD 3.5 billion by 2024; according to a new research report by Global Market Insights, Inc. Adoption of composite materials to reduce overall airplane weight and enhance fuel efficiency will boost aircraft lightning protection market growth during forecast period. The composite materials have multiple inherent advantages, but these resist current flow that may damage airplane structure. On an average, commercial airplane fleet face lightning strike once every 1,000 hours of flight time. The strike travels across the exterior surface and continues to hit the ground. The extent of damage depends on duration of strike, amount of energy dissipated and attachment & exit locations. Airplane manufactures employ conductive materials on external surface to enhance overall conductivity of airplane which in turn will fuel the aircraft lightning protection market size. Continuous rise in air passengers is attributing to increase in aviation vessel requirements. As per International Air Transport Association (IATA), by 2036, the air passengers are anticipated to reach 7.8 billion. Passengers are shifting towards air transportation from sea and land transportation owing to better safety and less travel duration. Further, the major aviation industry players are undergoing expansion to meet previous production backlog. Such factors will propel aircraft lightning protection market size from 2018 to 2024. Government regulations including Federal Aviation Administration (FAA), Military Standards (MIL) and Society of Automotive Engineers (SAE) provide essential requirements for deployment of protective materials in airplane structures to enhance conductivity and ensure passenger safety. Installation of advanced materials to meet regulatory standards will accelerate aircraft lightning protection market growth. In 2017, lightning protection material accounts for over 94% of overall revenue with application to protect airplanes against lightning strikes. The materials are placed in structure as well as on external surface. The expanded metal foil is placed in structure above composite material to enhance conductivity, and grounding wires & static wicks are placed on trailing edges to discharge charge into atmosphere. Further, employment of static wicks to transmit static discharges and reduce radio communication hinderances will positively influence the aircraft lightning protection market growth. Civil end user segment will dominate aircraft lightning protection market with large airplane fleet to accommodate air passengers. Increasing per capita income in conjunction with decreasing air fares form airline operators to strengthen customer base has led to surge in flight iterations thereby increasing product demand. Commercial aircraft lighting protection market accounts for around 35% of overall revenue in 2017 with strengthening of commercial aviation industry. Major airplane manufacturers are increasing deliveries to meet growing demand for airline fleets from airline operators. For instance, in 2017, Airbus delivered 718 airplanes as compared to 688 airplanes in 2016. Continuous increase in aircrafts will propel product demand during the forecast period. Regional jets aircraft lightning protection market will foresee steady growth as it enhances profitability and offer critical and convenient air service to small airliners. For instance, in February 2018, Lufthansa airlines has added CRJ100 jets to connect to western and eastern European cities from its hub in Hamburg, Dusseldorf, Munich and Frankfurt. Further, the business jets industry share will grow with rise in trading activities across the globe. Line-fit segment leads aircraft lightning protection market size. The protective materials including expanded metal foil, transient voltage suppressors and grounding wires are installed during airplane fabrication. Ongoing innovations regarding decreasing metal foil weight to aid composite use will support product demand. Further, retrofit will witness sturdy growth with rise in MRO facilities across the globe. North America dominates aircraft lightning protection market size with rise in airplane production and deliveries. Government of Canada and the U.S. Federal Aviation Administration (FAA) regulations regarding empty airplane weight have surged the application of composite materials. Adoption of methods for conductive treatment of composites will enhance product penetration. Asia Pacific will register around 6% CAGR over projected timeline with increasing passenger traffic. The airline operators are reducing airfare in countries including China and India thereby enhancing product requirement. Key industry players of aircraft lightning protection market are The Gill Corporation, Saywell, L3 Aviation Products, Dexmet Corporation, Microsemi Corporation, Honeywell and Cobham. Other important players include Wire Masters, The Expanded Metal Company, Benmetal, Niles Expanded Metal, Exel Group, Proteck devices, Avidyne, Astroseal Products, Dayton Granger, TE Connectivity and Saab. Companies are launching innovative products to increase their market share. For instance, in July 2015, Dexmet Corporation introduces thinner expanded foils for high performance applications.